Denham UK, 2017-Jul-28 — /Travel PR News/ — Travel can play havoc with our mental and physical wellbeing. So many of us spend hours at the gym, watching our diets or taking early morning yoga classes, only to see all the great results fly out the window when we board the plane. Increasingly travellers are realigning their priorities to put wellbeing first in today’s over-scheduled and ‘always on’ culture. As they increasingly endeavour to stick to good routines on the road, ‘wellness travel’ has flourished, outpacing regular travel by 50% and reflecting the need for travellers to recharge, refresh and rejuvenate themselves to maintain a healthy life balance. 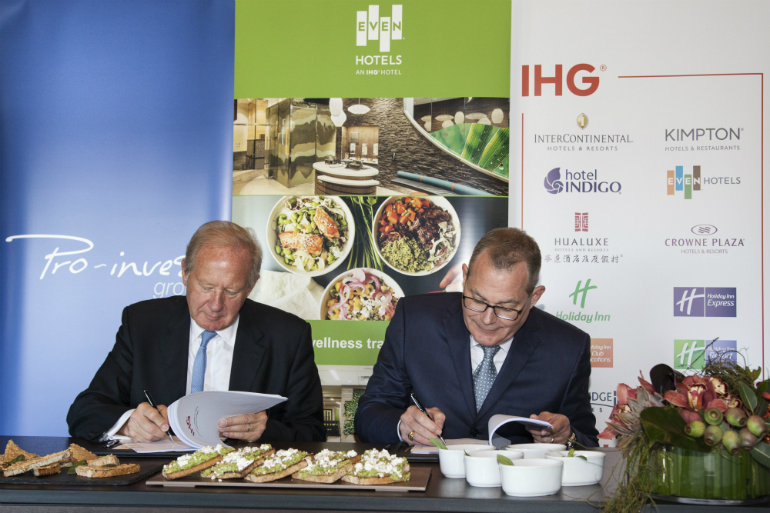 IHG® (InterContinental Hotels Group) and Pro-invest Group today (26 JULY 2017) herald the ‘age of the healthy traveller’ in Australasia with the first signing of an EVEN Hotels property in New Zealand, the first and only global hotel brand with wellness at its core. EVEN Hotel Auckland is scheduled to open in 2020 and is the first of the brand to be signed outside of North America. It is also the first in Pro-Invest Group’s portfolio of 10-15 EVEN Hotels across the capital cities and economic hubs in Australia and New Zealand, in partnership with IHG. The EVEN Hotels brand was home grown by IHG based on an understanding of the consumer shift toward holistic wellness – especially as it relates to travel. Best-in-class fitness facilities, in-room exercise zones and simple, fresh and organic foods are the cornerstones. Beyond food and exercise the brand offers initiatives that build on the bigger wellness picture, such as bedrooms with plush bedding, aromatherapy amenities, intended to encourage a good night’s sleep and lighting profiles that energise and relax. IHG has partnered with leaders in the wellness space to deliver the best experience for guests across all EVEN Hotels in Australasia. Nutritionally-designed menus and quality, ethically-sourced food will be supplied by THR1VE, the food experts who are focused on extraordinary health, deliciously simple. Fitness facilities will include a state-of-the-art, multi-functional zoned gym and flex space for small group fitness classes, and in-room fitness elements. Located in the very heart of Auckland’s centre, at the corner of Albert and Wyndham Street, the 200-room EVEN Hotel Auckland will not only look different, but will also have a distinctive vibe. It will feature fresh, natural and modern design; bringing the outdoors inside and offering playful and energising workspaces, dining and social areas, natural outdoor spaces. It will also feature design and technology elements to enable guests to maintain the balance they desire on a daily basis. IHG currently has 32 hotels operating under four brands across New Zealand and Australia: InterContinental® Hotels & Resorts, Crowne Plaza® Hotels & Resorts, Holiday Inn® Hotels & Resorts and Holiday Inn Express® with a further 14 in the pipeline including Hotel Indigo®. This entry was posted in Business, Hotels, Resorts, Travel, Travel Management, Travelers and tagged EVEN Hotels property, IHG, Jan Smits, New Zealand. Bookmark the permalink.